Boston's City Hall and the accompanying plaza have long been a source of debate among residents. Many find the space to be poorly utilized, daunting, and unattractive, while others appreciate the bravado and thoughtfulness of the design. As small collective, a group of designers launched a radical campaign to respond to an RFI put forth by the city: how would you improve the space? Given the grassroots nature of this project, social media played a huge role in the development of not only how the team responded to the RFI, but also in how the identity was developed. 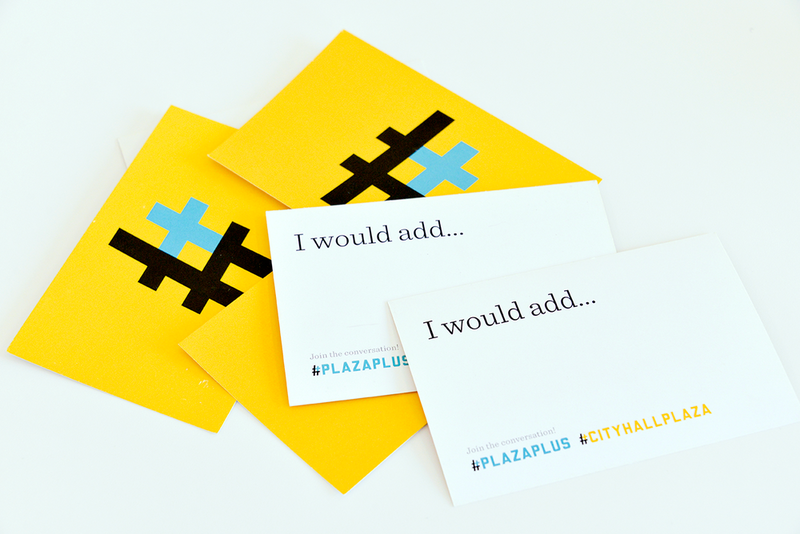 The project was branded as #PlazaPlus with an accompanying logo which married the hashtag and the plus sign, alluding to the public input crucial to the project's success. Once unified, the team took to the plaza to interview Bostonions about how they would improve the space and incorporated these suggestions in to the design ideas for the often maligned structure. This final response took the form of a book, highlighting the problematic elements of the space and a twofold approach to updating the plaza: an overhaul of the physical space in additional to a creative programming agenda. While the fate of the plaza still remains unknown, the effort seemed to spark an interesting dialogue across the city and inspire design initiatives for the space. There are multiple interacive moments where readers are able to open up and explore items that would normally be confined to a limited format.